Most of the files in this archive are encoded in a “lossless” format (FLAC, SHN). Lossless encoding is not as user-friendly as MP3s, but the quality is much better. Click here for more information on downloading, converting, and burning FLAC, SHN, and DVD files. Many thanks go to ViaChicago members Analogman, Gogo, AricAndover, Carsten, Leslie Hapablap, Sammy, and many others. This archive would not exist without the hard work and support of these generous people. And don’t forget to buy any Wilco-related recordings and merchandise that you can get your hands on; these are great people with big hearts who love to give, so please don’t just take from them. 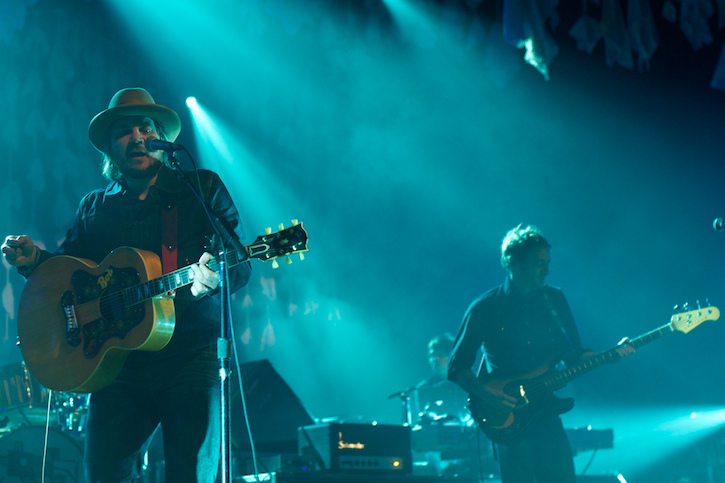 Click here to access the Wilco Archive. Does anyone have the audio from the Beacon Theatre shows, specifically the one from 3/19/17? Does anyone have the Beacon Theatre shows, specifically the one from 3/19/17? Did anybody record the Mar 14, 2017 concert in Kalamazoo, MI? Hi, does anyone have the audio from the show in Buenos Aires? It was on october 15th, 2016. In the archive I found the show in Brazil, which was one day later. Thanks! Sorry, the show in Brazil was a few days before the concert in Argentina. Thanks for your help, everybody! Anybody get the Hall’s Island, Minneapolis show 8-20-16? I know the Current was livestreaming it. I was there, but Id love a recording to remember it by. I keep hoping that … the fact that The Current streamed it live … that there will be a high quality recording available. I’m with you on wanting a recording of it! Wow. What a great show! Same here. Was there and then listened to the re-broadcast and it sounded fantastic. Hopefully becomes a Roadcase. Sounded like one worth releasing. Anyone have a copy of the June 2016 Philly show at the Mann Center? Was fantastic. i’m also interested in 6/4/16 – what a great show! I’m happy to buy an “official” download of the Philly show (my first Wilco show). Do they typically make every show available? Much thanks to anyone who can track it down! A peak performance of this line-up. Does anyone know of FLAC Audio source?? Hey does anyone have a copy of Wilco at the Basilica Block Party 2015 In Minnesota. I would mean a great deal to me! Just looking to get it soonerer than laterer… FYI- for anyone who missed it…they did an incredible performance of the complete amazing new album “Star Wars” to lead off the show!!!! anyone have a copy of the show at the Greek Theater in LA on 8/5/15? appreciate any help. such a great show! I was at that show it was amazing and Im looking as well for a copy of 8/5/15 Greek. Does anyone have the 05-05-2015 show in Cincinnati? Does anyone have the Cinco de Mayo recording in Cincy from this year? Did anyone get a bootleg from Kansas City on Wednesday night? mine going on etree soon. there were two recordings made by hobbyist on TEAM KANSASOURI. edit (a lot). A happy crowd clapping clips. presumably due to the impending storm with lightning visible from the venue. show and for permitting the audience to record and share the memories! for the record, it’s not really “a bootleg” if the artist’s policy supports audience recording and no one is making a profit off of the fruits of this strange hobby some of us invest a lot of time and money in – taping is a labor of love. “bootleg” just implies “illegal”, “stolen”, or “unauthorized” to many in the masses. there are some a-holes that do sell these things, and they deserve all the bad karma they get. Just was at Red Rocks last night. Can anyone get me a copy of the show. I would NEVER even ask about something this soon, but my fiancee and I were there and it was the best show I’ve ever seen, and we are getting married on July 31st. It was very romantic and I’d love to give her a copy for the wedding present…. Any help is appreciated. And thanks for loving such a great band and group of guys! Totally jealous you saw them at Red Rocks. Oh my god you rule. Thanks so much for your altruistic generosity. Give it a second, the tapers might not have even gotten home yet, let alone started uploading their recordings. Solid Sound 2015? Come on… I saw you bootleggers. First two nights were great! Missed day 3. Cmon, I saw you there with your umbrella-covered mics! Okay, I’ll be patient. Check on dimeadozen or bt.etree in a few days. Or eventually Wilco will released SBD’s of the shows on their site. Does anyone have a bootleg of the May 1 2015 show in St. Augustine? still looking for 2003-06-27 Central Park, NYC. as always the time and efforts in spreading the music far and wide is highly appreciated. How do I download these shows all at once, rather than one file at a time? I’m using Safari if that helps. Does anyone know if the Winter Residency shows from Chicago in December 2014 are going to be released? Anyone have a bootleg? Desperate to find a copy from Dec. 11, 2014 specifically. check out http://bt.etree.org/?searchsss=wilco&cat=184 Sadly I haven’t seen the 11th posted anywhere. Hey. I have soundboard recordings of all the December shows in Chicago. Email me and I’ll hook you up. They’re amazing shows, superb sound quality, incredible setlists. Dream shows for any Wilco fan. Matt/Joe – Thanks for the replies! Matt – my email address is below (can’t figure out what your email is – sorry, I’m new to this board). Hello Matt, not sure how this will work. I am massive Jeff Tweedy and Wilco obsessive! I live in North wales, am a retired man and would love these shows. thank you for going to this trouble. Holy wow, if there is any way at all for me to also obtain a copy of those recordings please email me @ rnmclrnn@gmail.com I’m a huge wilcoholic. Hey, sorry for the delay but yeah man. I’m going to post links to all 6 Winter Residency shows here. Also I have a serious collection of Wilco and Jeff Tweedy solo shows, all excellent soundboard recordings. So if you’re interested I’ll hook you up. I’ll email you with more info, dates, etc. And I’ll post the links to download the Chicago 2014 Winter Residency shows on this page. He has the first night, too. And other shows from over the years. It’s a wonderful service and resource! Also, here’s a link for it if you haven’t found it yet. where do I get downloads from Sean Lennon + Wilco @ Jones Beach 2013? Hello people. This is an amazing list of shows. However, I’m looking for the September 17th 2011 show at Massey Hall in Toronto. I have looked EVERYWHERE! Any help would be greatly appreciated. ENJOY THE REST OF YOUR TOUR, We love to watch you Strut. Any shows circulating of these Summer 2013 shows with Bob Weir guesting? anyone know where to find a boot of the june 22 2012 show at red rocks?! Track 21 (I´m The Man Who Loves You) of tweedy 20080903 (Jeff Tweedy, Palma de Mallorca, Spain, Auditorio de Palma, September 3, 2008) is defective. Does anybody have this? Thanks. Great site! How I never happened upon this archive before I do not know. Thanks for the link Luke! I know this is pretty soon afterwards, but does anyone have a recording from the Wolf Trap show on 7/17/12? It was my first time seeing them live and would love to have a copy. I just wanted to say thank you for hosting this site as well as to the tapers for recording the shows. I’ve only recently gotten into Wilco, but I saw them this month in Tampa and I’m now completely addicted. wilco from the rolling stone weekender 2011. Thank you, everyone, for a fantastic resource. I saw the guys recently (October 11th) at The Colston Hall in Bristol in the UK… they were, as you’d expect, brilliant! It’s great to have access to these live recordings … I downloaded the gig recorded on 07-13-09 at Keyspan Park – Brooklyn, NY … after reading that it had been available on the band’s site for a while. It is great (I’m enjoying it a lot) but can anyone help me find ‘Via Chicago’ (it wasn’t played at that particular gig) … I loved the live version I heard in Bristol and would like to have an MP3 of it from somewhere else … but the filenames are a little impenetrable!! By the way … I went to look for a t-shirt but none are available … Let me know when they are again and I’ll certainly buy one to show my gratitude! Just sussed it out for myself!! Wilcobase! GREAT resource! nyctaper.com has downloads of Wilco 22/9/11 MP3’s & Flac on request & 23/9/11 MP’3s & Flacs available now. May I add my plea to Alfonso’s above? I do hope we are not breaking any rules with all this shameless begging! Thanks in advance, best regards and thanks again to those responsible for this awesome page! Hello there, I´m a big Wilco fan from Spain. Does anybody knows where can I download the Sasquatch show that NPR made available only for a day? I know the stream is avalaible, but I´m not interested in it, I really NEED to have this in my ipod (Wilco shows are the best soundtracks to gym and running!). Thanks in advance and congratulations for this web, a real Shangri-La for the Wilco fanatics! You really do me a great favour! http://WWW.NPR.ORG – Download and streaming – Wilco live 2 hour show from “Sasquatch” 31 May 2011! Thanks for the heads-up, but I can’t find any way to download the show, and playback freezes after 30 min or so in my computer… Does anybody know where it can be downloaded? What I heard sounded freakin’ awesome!! Looks like NPR only had the lossy download up for a day or two..Sorry about the bum steer..You should still be able to stream tho, I haven’t had any probs. Can someone please post their ideas for TOP 10 shows on this page? Wilco, JT, etc. I kinda just want to collect the best sounding shows from different eras. Or if they aren't the greatest quality but have other elements that make them stand out, that'd be nice to know what people think, too. Thanks for site…anyone have the madison 20 February 2010 web version? Thank you for his amazing resource. Unfortunately, the link to Wilco's June 17, 2007 Bonnaroo Webcast Video is broken. This should now be fixed. Thanks for letting us know! Thanks for this! Brilliant. Have been thoroughly enjoying the YHF demos. Oops, sorry for not saying thanks for a great site too. Amazing job!!! Just wondering if anyone has ever come across a recording of July 19th, 2009 at Artpark, Lewiston NY. It was a great show. Thanks for this terrific site. It is a wonderful resource and it is greatly appreciated. It is wonderous. BTW, how rude of me just to come barging in here without saying thank you for the awesome site!! Really a fabulous resource for Wilco junkies. The "Yankee Hotel Foxtrot Unknown Studio Session" is interesting, but doesn't appear to be from YHF sessions at all. It sounds totally like a a pre-show soundcheck. Track 1: "Wishful Thinking" – which makes me doubt it's from 2000-01 as theorized in the notes. This song didn't come out until "A Ghost Is Born" (2004) and according to WilcoBase was never performed live until 2004. Then again, stranger things have happened…and this IS Wilco. "Spiders (Kidsmoke)" from A Ghost Is Born was first done in 2001, so this could have been an early working version of "Wishful Thinking" also. Plus, "Ashes of American Flags" is referred to on mic as its early working title, "Cash Machine." Track 7 is the classic "Sunken Treasure" from Being There (1996). I wish I could shed more light on this, but only the person who posted it would know where it came from. Anyway, as I said, I'm pretty sure it's really just a soundcheck. Great site for a great band. I don’t suppose there is a recording of their show at The Troxy in London, August 2009? I was there and it was incredible, and i’d love to be able to commemorate it with a recording. does anybody have a decent quality recording of the original poor places song? I live in Illinois just outside of Belleville. I have been a Wilco fan since Being There and Mermaid Aves. I have never missed them when they come to St.Louis. I have also seen them in Madison WI and I just flew to Savannah GA on March 25 2010 to see this tour. I would greatly appreciate any recording of that show. I took my brother who lives in Savannah and he had never heard of Wilco and he fell in love with there music and I would love to send him a copy. Thanks and thank you for having such a great site. I have bought all there cds and movies but nothing beats a live recording of a show you were at. Many thanks again and keep up the great work. Does anyone know a Wilco show where they covered "Mr. Soul"? Many thanks. Jill, if you look at WilcoBase – last entry below under "Friends" – you won't find any reference of Wilco (or Jeff or related acts) covering "Mr. Soul." Would be a great idea, though! Looks like a couple of times they've teased the intro to Mr. Soul before covering Neil Young's "Broken Arrow." The "Mr. Soul" tease is actually the beginning of "Broken Arrow." Neil Young recorded a faux-live sounding "Mr. Soul" as the start of the song. Putting up this website should earn you a good seat in Heaven. The show has not appeared yet. A lot of shows from this past tour have not appeared. Does anybody have Arlene Schnitzer Auditorium (Portland OR 2010) show for download? Please post…was at the show and love the version of Sunken Treasure! Wilco & Tweedy have inspired me to write again. I've been writing & recording instrumentals for the past 3 years. I even went back to songs written 15 – 20 years ago & re-did them.